Sinker Butte is located in southern Idaho desert, on the Snake River Plain, near Swan Falls Dam. Sinker Butte itself is nothing spectacular. But crossing the dam on the way is kind of neat, and there are plenty of cool cliffs around to make for some okay scenery. Plus it’s less than an hour drive from Boise. I’d been saving Sinker Butte for a winter hike when I didn’t have a full day to work with. It was only about a 45 minute drive from my house to Swan Falls Dam, and I started hiking in the fog a little after 10am. After crossing the dam, I followed an animal trail pretty much straight up the slopes until I met the road on the shelf above. The snow was thin, and I followed the road until I was due north of Sinker Butte. Then when the road headed west, I headed south up the open slopes. 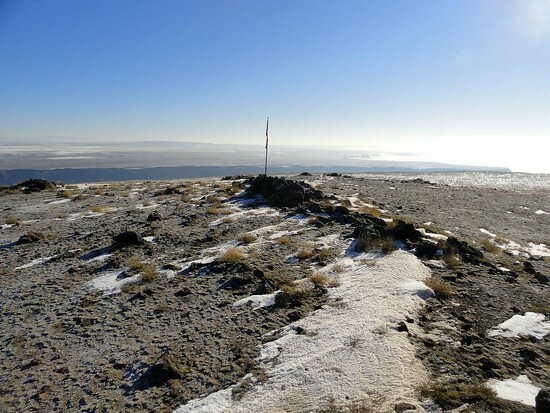 It wasn’t long before I reached the highpoint, where I found a pole with the remains of a tattered flag. The wind was blowing pretty strong, but it wasn’t very cold so I hung out for a while checking out the views. Sinker Butte isn’t much taller than the surrounding plain, but it’s enough taller to give some pretty good views of the Owyhee Mountains to the west, and even the Boise Mountains to the east. The day was young, so I decided to make a loop and do some exploring to the east. The map made it seem like there could be a couple decent descent options, but there was no guarantee given all the cliffs in the area. After hiking over to the southeast corner of the summit plateau to check out some great views up the river, I found a way down onto the large shelf below. And then I eventually found a rocky gully to scramble down in order to reach the road again. Finally, I followed a nice trail along the river bank back to the dam. Round trip was just under five miles hiked in two hours and twenty minutes. Map of the route, just under 5 miles and 1200' elevation gain round trip. I hiked counterclockwise. A foggy start to the hike. Finally up out of the clouds. I left the road here, and hiked the ridge on the right. Nearing the summit of Sinker Butte. View of the Owyhee Mountains to the west. Tattered flag on the summit of Sinker Butte. Looking for a way back down. I scrambled down this gully. Descent gully from a distance. Hiking along the Snake River. A few dozen Cormorants hanging out above the dam. Swan Falls Dam on the Snake River. Sinker Butte from the other side of the gorge during the drive home.